One of the terrific things about living at lakeside – or almost anywhere in Mexico for that matter – is being able to fuel up on nutritious snacks at the drop of a sombrero. Need a quick vitamin boost to start your day? Pop in at the Chapala mercado, a breakfast spot or street stand for a tall glass of fresh-squeezed o.j., bursting with sweetness and a natural dose of vitamin C. Order it sin colar (without straining) to get all the pulp and extra fiber. Alternate the taste sensation with other juices, plain or mixed, like carrot, grapefruit, and lima, a delicate-tasting citrus cousin that’s said to be great for digestion. One of my personal favorites is jugo verde, a combo of orange juice, pineapple and alfalfa whipped up in a blender. Variations are made with other kinds of green stuff, such as celery, nopal, parsley, spinach and chard. Health food nuts claim that green juice helps detox, strengthen the immune system, fight chronic disease and obesity, and improve sleep patterns. I love the fresh flavor and momentary sense of being kind to my body. Other healthful fast foods options are the frutas picadas (sliced fresh fruits and veggies) sold by sidewalk vendors. Choose from watermelon, pineapple, orange, jícama, cucumber, mango and prickly pear (when in season), solo or combined, stuffed into a plastic bag to eat on the go. Enhance native-style with a pinch of rock salt, powdered chile and big squirt of lime juice. It’s no surprise that maiz, Mexico’s most basic food stuff, is another source for popular street fare. Whole elotes (corn-on-the cob) are boiled in large metal tubs or charred on a charcoal grill. Dentally challenged seniors like myself prefer esquites, kernals sliced off the cob and served in a cup. Try it either way, topped to taste with salt, chile and lime or crème fraiche and crumbled white cheese. A new trend in a similar vein is chowing down plates of assorted cooked vegetables, including potatoes, chayotes, broccoli, cauliflower and beets, garnished as above. 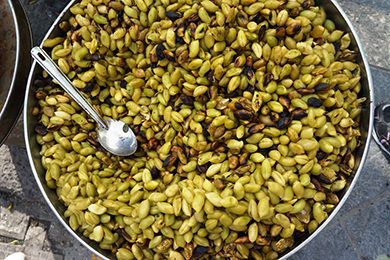 Topping my list of typical treats are guasanas, fresh chickpeas that are steamed in their fuzzy pods in a bowl-shaped metal griddle set on a brazier. Some folks like them tatemados (blackened) for a toastier flavor. Garbanzo is a major winter crop cultivated in the Lake Chapala region following the fall corn and wheat harvest. That is why the beans are available in abundance in their green stage. Forget the fact that these little nuggets are loaded with vitamins, mineral and fiber. Get over the messy business of popping them out of their skins one by one, leaving your fingers coated with salty goo. Guasanas have a scrumptious flavor, somewhat like a hardier version of green peas. If that appeals to your palate, you may find them as addictive as munching on popcorn. Even as the market for processed junk food booms in this country, it’s wonderful to observe that people young and old still have an insatiable appetite for real foods of true nutritional value. ¡Buen provecho!